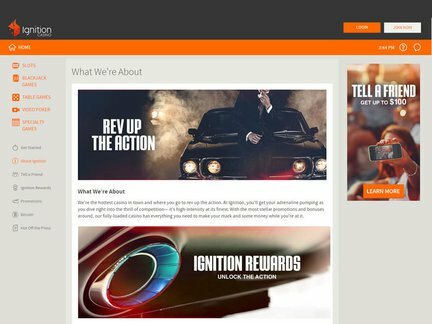 Ignition Casino ignites passion for online casino gaming! The website has a highly original appearance. Since it is a new casino, the various sections are not yet fully developed. The strategy and game review sections appear empty. But some big promises are made on the casino blog. There is talk of endless, high-intensity gameplay and limitless Ignition Casino Bonus deals. Some positive signals are sent to the player who wants to explore the promotional deals. A number of fairly large promotions are already introduced on the main page. First-time visitors can obtain a 100% casino match bonus up to $1000. The staff has prepared a generous offer in order to get the ball rolling. When one compares the welcome deal with what can be found on other casino sites, the promotion is providing a noticeable advantage. The follow-up deals keep the excitement alive! A weekly boost offer is especially noteworthy, since the players can count on seven weekly 100% match bonuses up to $100 each! The bonus can be redeemed up to seven times, so there is plenty of reason to be active on the website. Sharing one's passion for casino games can also bring financial rewards. The „tell a friend" program allows a person to receive 200% of the friend's first deposit up to $200. At this point in time, the exact deposit options are unknown. This could be the result of the fact that the casino has been recently established. Not much information is revealed about the security measures, presumbly for the same reason. On the other hand, it is clear that the casino cares about social media presence. It will probably take some time for the players to recognize the casino and eventually pitch their tent here. The marketing effort is surely under way. Since the casino is part of the same group as Bodog/Bovada and Slots.Lv, it has good potential in terms of future growth. A US player-friendly casino is going to appeal to users who have been turned away from other places due to access restrictions. American players will also be supported in other ways. For example, the $ currency is shown next to the amounts of money that are advertised with each deal. Right now, the terms and conditions are not specified, which makes it difficult to determine whether players from other countries will find the same support. On the surface, the website has everything that it takes to provide online casino services across borders. It could find a receptive audience around the globe. The beautiful game graphics are part of the attraction for players. The World of Oz is particularly intriguing. The game is an absolute feast for the senses. It has fifty lines (In fact, it has more paylines than a typical slot game). Tycoon Towers is another heavily advertised game. It is a 5-reel, 50-line slot game with some nice music background (Jazz lovers will be pleased!) and sticky wilds. Ultimately, the wilds can result in a higher amount of coins that can be collected. It is worthwhile to read the game descriptions before deciding to play. Down the road, the casino will likely have a more informative game review section. The slots can definitely become a big hit among users. Public online forums are a place where the players voice their concerns. There are no examples of such complaints anywhere. Time will tell whether the neutral status can be maintained. More players are introduced to the casino on a daily basis. One thing needs to be emphasized though: a more transparent customer service section is badly needed here. It's kind of hard to figure out the contact options. The social media pages cannot be a substitute for real human contact. The absence of information concerning authorization can be excused, if there is a plan to reveal such important details soon. At this point in time, the players won't be able to tell whether the casino has been the subject of a review by a professional licensing body. This could be a temporary issue. Hopefully, the info will revealed as part of the the development of the various sections of the website. There is still a lot of things that need to be in place for the website to function like a normal online casino. But I could also understand why some players would want to take a plunge and start playing the games immediately. I've seen some amazing game titles on this website. These games are very fun to play! The fact that US players can be a part of the whole experience is a big plus. In terms of the promotions, I was particularly impressed by the weekly boost offer! I would love to see the casino once the sections are developed more fully.